Solar Photo voltaic is proven technology with more than 1,75,000 MW of installed capacity over the world. Europeisa pioneer and leader in solar power installations with countries like Germany,Italy, France and United Kingdom at the forefront.These countries promoted solar PV since last decade by providing attractive tariffs for sale of solar energy. At the end of the 2014 total installed capacity in Europe stands at about 90,000 MW. Solar energy is important source of energy with some of these countries sourcing more than 7% of total energy. Following suite, since last three years, installations in the Asia-Pacific region and America are also beginning to catch up.China, Japan and US added about 30,000 MW of capacity in 2014 alone. This is more than 75% of capacity installed during the year in the world.India has installed about 1,000 MW during this period. India is blessed with one of the highest solar resource in the world. On an average 4 to 7 units of energy are incident per square meter. An average of 250-300 sunny days are available when solar plant can generate power close to its maximum efficiency.To meet rapidly increasing demand of electricity, India has set target of 1,00,000 MW capacity by 2022. To achieve this target, Central Government has provided benefits - Accelerated Depreciation, Tax Holidaysfor revenue generated from Renewable Energy and Solar Energy Purchase Obligations for promoting solar power projects in the country.In addition, Central and State Governments have come up with various incentives and schemes to achieve this target. Due to these efforts, installed capacity of solar power projects in the country has crossed 4,000 MW. Large, utility scale solar power projects have been the centre of attraction in India thanks to implementation of the National Solar Mission and Reverse Bidding in States. Governments have facilitated such projects by providing developers with land permission, single window clearance, power evacuation facility and subsidies. Due to these efforts, large-scale grid connected projects make up most of the solar capacity in the country.Recently opened bids in Madhya Pradesh have resulted in a tariff of as low as Rs. 5.05 per unit for 25 years. This isa record low price for solar power generation in the country.Cost of electricity from coal is about Rs. 2.50 to Rs. 3.50 per unit which is only going to go up in the near future.Ministry of New and Renewable Energy (MNRE) has proposed a Scheme for Development of Solar Parks and Ultra Mega Solar Power Projects in the Country. Under this scheme, utility scale solar power projects of capacity 20,000 MW have been planned by year 2019. Maharashtra is the leader in industrialization as well as power capacity in India. However, demand for power is expected to outstrip supply rapidly in the coming years. Solar energy can be an important contributor to electricity supply mix in the state. To tap the huge potential for solar energy in the state, Government of Maharashtra has approved policy on renewable energy which targets installation of 7,500 MW of solar power projects in next 5 years. The projects will get deemed NA permission, deemed industry status, deemed open access permission. There will be no need for no-objection certificate and consent letter from the MPCB and method for registration with the Maharashtra Energy Development Agency would be simplified. Success of these projects will depend on provision of infrastructure such as land, water and evacuation facility by the government. Onsite solar i.e. solar on rooftop or within the consumer premises, promises to provide answers to multiple challenges faced by India in its quest to provide electricity to its entire population.One of the key advantages of onsite solar power is its modularity. 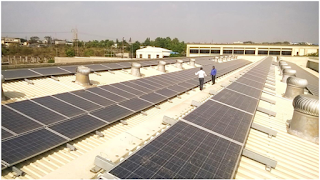 Vacant land or rooftop in the consumers’ premises can be used to install solar power plants. The system can be synchronised with the internal grid and backup diesel generator. It can also be easily dismantled when required. Typical rooftop solar power plant consists of solar panels, inverters for converting direct current to alternating current, monitoring systems and balance of system including mounting structures and other electrical components. The Government has recognized the inherent advantages of on-site solar power. This is reflected in the significant share of on-site solar in capacity targets – onsite solar has been allocated a target of 40,000 MW out of the total target of 100,000 MW. To promote onsite solar energy, Maharashtra Electricity Regulatory Commission (MERC) has published Draft Net Metering for Rooftop Solar Systems Regulations, 2015. As per these regulations, any consumer subject to fulfilment of specified conditions, can install grid synchronized solar power plant of capacity up to 1,000 kW in the premises. Any excess power generated by solar power system during holidays can be injected into the grid and consumed later. Final regulations are expected to be notified after stakeholder consultation. Due to rapidly increasing tariffs for industrial and commercial consumers, solar energy has become a viable alternative to replace daytime consumption. A typical solar power plant lasts more than 20 years and provides substantial cost saving over its lifetime.There are two options for sourcing Onsite Solar power. Consumer can invest in a solar power plant installed in their own premises. Alternatively, an external investor may install a solar power plant in the consumer’s premises and sell power to consumer at a pre-determined rate. Considering the limitations of acquiring land and setting up large scale transmission infrastructure, on-site solar provides a faster and more efficient way of addressing our energy requirements. Many large consumers have already installed solar plants on their rooftops and spare land in their premises. As consumers become more familiar with solar power, it is expected that it will be adopted faster and at a much larger scale. Ashish Tikhe is Manager – Policy and Regulations at Sunshot Technologies Pvt. Ltd.
Sunshot Technologies provide On-Site Solar Power solutions to industrial and commercial consumers in the country.